This is part 2 of PHP file upload series. You can find part 1 of this series at PHP File Upload Tutorial (part 1). In this tutorial, we are going to display uploaded files (images) on "index.php" and implement delete function. At the end of the tutorial, we also provide the downloadable source code. Make sure you have followed part 1 of this series, and implement the steps correctly. If you do, now you are free to move on to step 2. Currently if we open "index.php" file from browser, after uploading images files, there is no interface for us to see what images are uploaded. 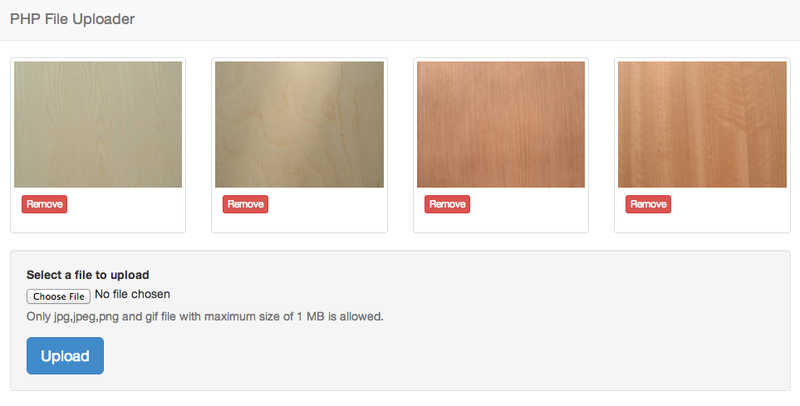 To overcome this issue, we will scan the "uploads" folder and display whatever images inside it on "index.php" file. Now let us take a close look at what we actually added to the file. First we use PHP function "scandir" to scan "uploads" folder. This function will return folder's content in an array format. So we loop through the returned array values, and if the value equals to "." or "..", we will ignore them. "." and ".." here stands for current directory and parent directory. Since they are not the actually folder's content we needed, we ignore them. At the end we use PHP "is_file" to make sure the image file exists and display them. Meanwhile, we add a remove link to each image. We will implement the delete function next step. If you have followed so far, we believe that you must have noticed the only missing function is to delete uploaded files. That is what we are going to implement in this step. Open the "remove.php" file, which we have created a while ago in part 1. And copy the code below to it. This file is simple and straightforward. First we get the file's name from URL using $_GET request. Then we check if the file exists, before we remove it using PHP function "unlink", at the end, we redirect page back to "index.php". If you have followed all steps correctly, you should now have a full working file uploader application.